BIRMINGHAM, UK (VIP NEWS) — A building which hosted British music legends such as The Beatles and The Who in their 1960s heyday has partially collapsed after a fire. 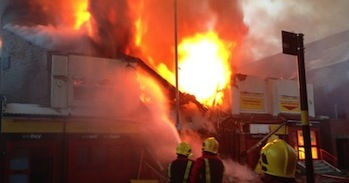 Part of Kings Heath High Street in the Birmingham suburb was closed for hours after the fire at the building, which is now a Cash Converters store. The building in York Road was formerly the Ritz Ballroom, which also hosted The Rolling Stones in the 1960s. Officers said they were treating the fire as suspicious. No-one was hurt. The road, one of the main routes into Birmingham, was closed for several hours between Poplar Road and Silver Street, but has now reopened. The blaze started at about 05:00 GMT and, at its height, up to 40 firefighters were called to tackle the flames. Fire officers remain at the site. Structural engineers will now examine the remains of the building to decide how stable it is, but about 70% of it has collapsed. Music historian Jez Collins, who runs the online Birmingham Music Archive, said it was "very sad" to lose the building. "In Birmingham we've lost so much of our musical history," he said. "If you compare it to other cities like Liverpool and Manchester, which have really made something of their famous venues, we've lost a lot. "It's the memories that are attached them – people remember going to the Ritz to see The Beatles, The Stones, The Animals, Pink Floyd and all the big names of the time. "People met their husbands and wives there and now that building's gone." The venue shut in the 1970s and the building has been occupied by various shops since. Celebrations had been planned for September in Kings Heath to mark the 50th anniversary in September of the Rolling Stones playing at the venue. A Kings Heath Walk of Fame, honoring the area's musical and comedy heritage, had also been planned to start outside the building with a star marking singer Toyah Wilcox. Local 'landmark', Dave Janes, from the fire service, said the collapse of the building was likely to hamper the investigation into how the fire started. Most of the building has now collapsed, the fire service said. Businesses in York Road are shut but those on the High Street were open as normal. Kate Smart, Kings Heath town centre manager, said some of the surrounding buildings had been damaged by smoke. She added the area was a "close-knit community" and that they were "devastated" to lose such a "landmark property".